Richard King, Solar Decathlon organizer, keeps a daily journal during the 2007 Solar Decathlon. 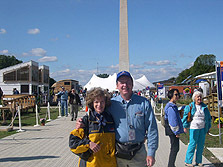 The daily journal highlights the events during and leading up to the 2007 Solar Decathlon, held on the National Mall in Washington, D.C., from October 12-20, 2007. In the weeks before and each day during the competition, Richard King, one of the founders of the Solar Decathlon, covers the latest on the teams, their standings, and the events going on in the solar village. Also, don't miss the Photos of the Day, which help bring the event to life. The National Mall is back to normal—or as normal as it ever gets. But the world will never be the same, because the 2007 Solar Decathlon existed here for nine days in October. Read more. Have you ever had to pack up and move? A new house...a new city? Well, multiply that by about 100 times and you've got moving day at the 2007 Solar Decathlon. Read more. Faster than it went up, it seems, the village starts to come down. As of 10 p.m. last night, the 2007 Solar Decathlon shifted into disassembly mode. The Decathlon teams, site operations, security, safety, and everyone else are all back on 24-hour schedules. Read more. Today is a huge day for public tours in the village. The houses are open from 10 a.m. to 5 p.m. on this, the last day the complete village will exist for another two years. Read more. This is, indeed, the big day! The seventh and final day of competition, is possibly the most exciting of many we've already experienced here. At a crowded Awards Ceremony this afternoon, the Technische Universität Darmstadt (Technical University of Darmstadt) was proclaimed the overall winner of the 2007 Solar Decathlon! Read more. This sixth day of the competition began and ended with some memorable highlights. This morning, 150 points were on the line with the announcement of the Market Viability contest. Marketability, affordability, and buildability—all important considerations for the housing market—are measured and evaluated as part of this contest. Read more. This morning, 150 points were on the line with the announcement of the Market Viability contest. Marketability, affordability, and buildability, all important considerations for the housing market, are measured and evaluated as part of this contest. Read more. The teams gathered at 10:00 a.m. this morning for today's big announcement: the jury results for the Lighting contest. This subjective element of the Lighting contest, worth a maximum of 75 points, evaluates electric lighting quality and daylighting. Read more. At 10:00 a.m. this morning, the results of the Communications Contest were announced. Communications are important to get the incredible story of the teams out to the public. Read more. The Solar Decathlon is always an exciting place to be, but today it was especially so. Hundreds of students, media representatives, and visitors congregated in the center of the solar village at 10:00 a.m. for the Decathlon's first major announcement—the Architecture contest. Read more. Another beautiful, sunny day at the Solar Decathlon—we're so fortunate! And, just as we experienced yesterday, thousands and thousands of people came to the Solar Decathlon to see these beautiful, high-performance houses. Read more. Yesterday we opened the solar village and put on our public faces. But just prior to that, the teams paused for a group photo that included as many of them as we could pull away from putting the finishing touches on their homes. Read more. With great fanfare and a military color guard, Secretary of Energy Samuel W. Bodman cut the ribbon this morning to open the 2007 Solar Decathlon. The sun shone down from a blue sky here in Washington, D.C., as the wind blew briskly. Read more. We have come to our day of transition in the competition. The teams need to change from construction workers to tour guides and ambassadors of solar power. Read more. Today is the last full day of work. The teams are down to the wire to complete assembly and pass inspection. Despite all of the tremendous hard work of the last two years, the teams can't compete until the houses are safe and fully inspected. Read more. As the sun rises on day seven, the teams are getting ready for their final push to the finish of the assembly phase of the competition—only 40 hours or so are left. Read more. Today is Columbus Day, a national holiday in the United States celebrating the discovery of the new world in 1492. Five hundred and fifteen years later, here we are building a village that is going to define how we live in the new millennium. Read more. Sunday is a day of rest here at the solar village. There was another event sharing the Mall next to us called "Kicking for Kids Who Can't," which was raising funds for children who are born without limbs. Read more. We're halfway there—to having the houses and village fully assembled, that is. Today is the fourth day of the eight-day assembly period. By Wednesday, October 10th, all of the work needs to be done so that final inspections can be completed by Thursday afternoon. Read more. All 20 Solar Decathlon houses are now present and accounted for! Santa Clara University's house finally arrived late Friday at about 9 p.m. As their truck rumbled onto the National Mall, the team cheered and hugged each other. Read more. Secretary of Energy Samuel Bodman visited the solar village today. He arrived at about 2 p.m. and spent an hour visiting each house and talking to team members. He was mainly interested in the technologies they were using and how they were progressing. Read more. It was another very hot, sunny day on the National Mall—perfect for building the village. This is the period when we pray for dry weather, because some houses still don't have roofs on them and building supplies are all over the place. Read more. The assembly phase of the 2007 Solar Decathlon officially began just after midnight on the morning of Wednesday, October 3rd. Seventy oversized trucks carrying huge sections of houses rumbled onto the National Mall in the early morning hours, marking the start of an amazing 21-day saga. Read more. I attended Carnegie Mellon's send off last Thursday. Amazing team, very green house. Reminds me of UVA's 2002 project, which won best Architecture because of its pioneering design wrapped in sustainability. Read more. Wendy Burt and I attended Maryland's "LEAF House" opening last week on Tuesday, September 11. They had a rousing turnout on the campus in College Park. The LEAF house is not completely finished, but very close. Read more. On Thursday, August 16th, the Santa Clara University Solar Decathlon team held an open house for all their sponsors, friends, and fellow students. Read more. I had a wonderful visit today out at the University of Madrid's Solar Decathlon construction site. No, I did not have to fly overseas; they are here in the States, pre-assembling their house in Upper Marlboro, Maryland, outside Washington, DC. Read more. Mark your calendars — this year's Solar Decathlon is sure to be more competitive than ever! Stunning new designs, impressive innovation, and dynamic, motivated decathletes promise a show-stopping event. Catch a glimpse of the future with winning solutions. Read more.